Kayak & Raft & S.U.P. The Cable Rapid just a few miles north of Kernville. It's a wild trail of sparkling whitewater that divides the most rugged half of the High Sierra into East and West. The pristine headwaters of the Wild & Scenic Kern River emanate from the glaciers of Mount Whitney, the tallest mountain in the continental Unites States of America. 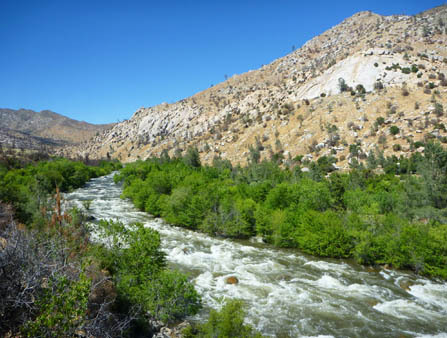 After travelling over a hundred miles through the hidden heart of the high sierra, the first hint of civilization that the Kern River sees is Kernville, the whitewater headquarters of the Sierra. Surfing waves at the Kernville Riverpark. Kayakers paddling the Class 3 Fairview Run. 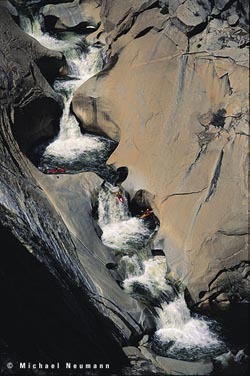 Kayakers running the sculpted Teacups of Dry Meadow Creek, just before it plunges into the Kern River. 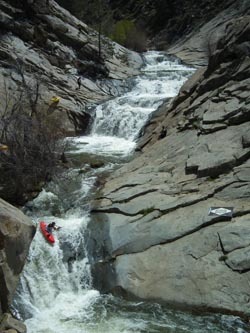 Here, you’ll find every level of whitewater from Class 5 to mellower Class 2 and flatwater on Lake Isabella. Kayakers, rafters, stand up paddleboarders, riverboarders, and fly fisherman come from all over the world to paddle the Kern River, especially during the peak flows in Spring and early Summer. 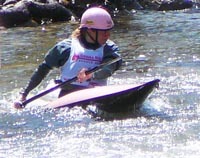 Olympic silver medalist and local, Rebecca Giddens, demonstrating her perfected paddling skills at the Kern River Festival. The legendary whitewater of the Kern River starts at the headwaters at Mount Whitney, and a few elite crews of expedition kayakers have paddled the headwaters to Kernville. An epic 18 mile wilderness run that is commercially rafted is known as "The Forks of the Kern," a class 5 rated run. Western Whitewater calls it "one of the finest expert runs in the West," while California Whitewater: A Guide to the Rivers says its "one of the finest stretches of expert whitewater on earth." 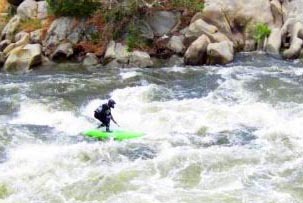 Expedition kayaker, Kevin Smith, observing the power of a raging Bull Run Creek in Kernville. Below the Johnsondale Bridge, the Kern offers a variety of class II-V runs, each with its own unique character. A series of named runs all lead into Isabella Lake; Limestone, Fairview, Chamise Gorge, Ant Canyon, Thunder, Cables, Powerhouse/Lickity, and Cemetery Run. Some of these runs can be kayaked year round. Lake Isabella is an excellent training spot for improving kayaking, rolling, or stand-up paddle (SUP) skills. Don't worry if it happens to be too windy; just click here. The Triple Drops on Brush Creek. Below Lake Isabella, the class III-V+ Lower Kern usually has great flows all summer long. Stretches of river, such as the Jungle Run and the Big 5 are commercially rafted for much of the year. 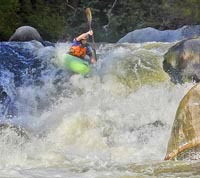 Accomplished paddler, Corran Addison, surfing SUP on Slippery Rock/Dam Run. SUP, or Stand Up Paddleboarding, is quickly becoming a standard sport in the Kern River Valley. Complete newbies can learn on Lake Isabella, while others may want to try some of the class 2+ rapids on the cemetary run. 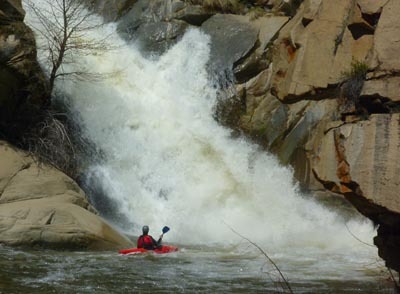 At higher flows, the Lickity Run, Kernville Riverside Park, Cemetery Run, and the Dam Run are great options for class 2-3 whitewater. 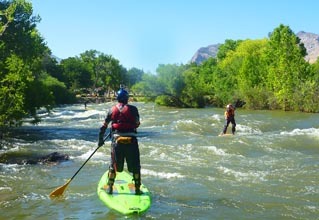 Rent or demo SUP's at Mountain River Adventures. Click here for Upper and Lower Kern River Flows courtesy of Dreamflows using US Army Corp of Engineer data. Southern California Edison flow diversions: SCE diverts up to 600 cfs of water from the Fairview to the KR3 Powerhouse above the Lickity Run. Water is also diverted from the Lake Isabella Dam to the Borel Powerhouse on the Lower Kern, and at the Democrat Dam. Call 877-537-6356 for the current SCE river flow and diversion information; especially if you need a good laugh at the vocally-challenged C3PO droid voices with blaring 1970's Atari sound clips in the background. 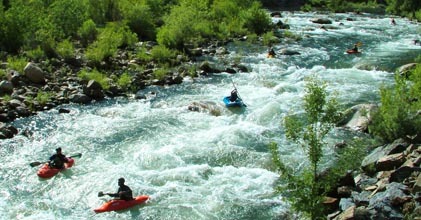 The Kern River Runs, Put-In/Launches, and Whitewater Rapids are depicted on the Kern River Sierra Map. Warning! Please read this disclaimer before using this website and any associated products. © 2019 Extremeline Productions LLC, All Rights Reserved.